The structural engineers over at Hyder Consulting have announced that they are planning what will be, by an overwhelming margin, the world's tallest skyscraper, coming in at double the height of the Burj Dubai – or very nearly one vertical mile. The firm has "confirmed that the tower would be located in the Middle East region," we're told, "but would not give any further details." So is it just a media stunt? 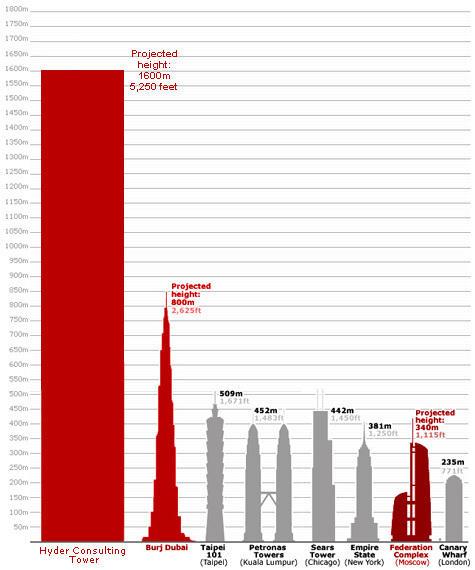 I decided, nonetheless, to alter an old BBC diagram about the world's tallest buildings to give myself a sense of what this might mean, size-wise; the results appear above. I have to assume that the building's actual profile will not resemble what I've created... but you never know. Note the comparative size of the Empire State Building. (News item spotted on Archinect – where we're reminded of Frank Lloyd Wright's Mile High Illinois project). How do you suppose those earthquake scientists are reacting to this? What fun; I look forward to hearing more about this one! Concerning your diagram, the base of the building would need to be has wide as you drew it. That's several NYC blocks!!! The Saudis must spend some of their profits in projects that require the West expertise, after all we're the ones buying the oil at the current ridiculous price. Esthetically, I don't think such a tower is commendable, imagine New-York with 1 or 2 mile high buildings, the skyline would be destroyed. Of course in the West such projects are not possible because of labor and material costs. Also over the last 5 years office space to rent has quadrupled in the western world. It currently takes 2.5 years to find a renter for a whole building floor. My comment is not very positive but we all know why spending like these in Saudi Arabia are currently possible. All I want to say is... wake me up when a skyscraper might hit its head on the moon from time to time. The impact on the skyline is an obvious one, but I would like to elaborate on Pierre's point about the base. If you look at the Burj Dubai, I've read it has an aspect ratio, or base to height, of roughly 1:8, whereas the Sears Tower is roughly 1:6. Even if this tower could approach 1:10 or greater, the base would have to be on a scale we've never seen before. Does this project even have a street edge? How does it fit into an urban fabric, or is the base an urban fabric on its own? Burj Dubai basically defines a new urban fabric based on it's lotus plan. Furthermore, I'm assuming the tower(s) would have be the next step from the Petronas Towers, so you create a sort of tripod. I'm guessing this way you might be able to reach higher and create a more broken up base. Either way, if this must be built, hopefully it at least redefines how we think about towers. On a side note, I find this rather interesting in contrast to your post about Amsterdam's proposed tunnels. In the land of new money we're reaching for the sky, in the old, well we're digging holes. Why the Empire State Building? Is there something special about it? A mile? That's nothing. How about 4km? I've been quite disturbed by this trend to build the biggest tower in the world, and i can't imagine what it reflects of the people who decide to build these monstrosities. a desperate grasp of superiority in engineering? national pride? it must go deeper than that. isn't this an outdated concept of what is might? "Very nearly one vertical mile"? So they're going to go to 1600 metres and not bother adding the 9 more to make it up to a full mile? That would be a breathtakingly feat of opportunity-missing. The 1600 number is rounded, surely? @urbanagent: Concerning street edges and urban fabric, i think the word you're looking for is arcology. Right now folks at SOM, KPF, Pelli, & PDI World Group are in a paid competition for the design of this building. I can just imagine the amount of core space required for elevators and inefficiencies of the Hyder consulting building. Maybe they'll build it - but the only person who ends up living there... is some random janitor who gets trapped in the building after the rest of the world is destroyed by the apocalypse. He wanders around on the 332nd floor, looking out the windows, feeling lonely, reading old newspapers, occasionally writing things down, waiting for someone else to show up. Yes, why not another 30 feet or so. An opportunity to join "The Mile High Club" even if you have a fear of flying. Geoff, I really love how your old posts and comments occasionally dovetail with new posts. I just received in the mail a copy of JG Ballard's High Rise, which I bought off of eBay after you referenced it a few weeks back (I'm really enjoying it so far). And as I'm sitting at my desk at work, I read your comment on the janitor sitting high in the building, waiting out the apocalypse, I'm drawn back to the book, to the internal war raging on in the high-rise. I can't help but wonder what kind of society would develop in a huge structure such as this and how their lives would play out. Thanks for a great book recommendation and a great site that never fails to challenge. No problem, Morgan! Thanks for the encouragement, and for sticking with the site. Glad you picked up the Ballard, by the way - that book is completely over the top, but fantastic and frequently hilarious. Super-Cannes is good, too, if you come away from High-Rise wanting to read more. Canary warf in London???. In MADRID there are 4 buildings taller than Canary. About 250 meters more less. Geoff - I'll definitely check out Super Cannes. You're right, High-Rise is over the top, but some of the ideas (and broad generalizations) around class, social hierarchies, design, and architecture are pretty intriguing. Interestingly enough, there's an article in The Atlantic that talks about the decline of the suburbs, and some of the violence going on in neighborhoods of 500k McMansions. Here's the link if anybody's interested: http://theatlantic.com/doc/200803/subprime. That's really interesting, Morgan - not only do I think that the American version of High-Rise would be set in a gated community, exactly like that Atlantic article, but there's actually a book that came out last summer, called Boomburbs, by two Brookings Institution scholars, that forecasts the same sort of slumification, so to speak, of certain suburban neighborhoods. Anyway, it's fascinating stuff. After all, will the riots of the future break out in unmown cul-de-sacs outside San Diego...? If you build it, they will...not really care. Could be the "Mile-High Tower" in Jeddah. There is also a tower in the works in Dubai called the Al Burj that is likely going to be around 1200 meters tall. If you aren't already a member you should check out the forums on www.skyscrapercity.com - it's probably the largest worldwide community that focuses on urban development. You might as well just call it Babel. Rikkus: "Why the Empire State Building? Is there something special about it?" Yes, there is, definitely - as you probably fully well know. But to enlighten you further - and this is strictly layman stuff - it happens to be the most beautiful of the towers represented, as well as being, by far, the most iconographic. Which alone makes it the most appropriate choice when it comes to making size comparisons. Amen, finance monk. Nimrod reached for the heights, and things didn't turn out so well. History records that the building committee couldn't agree on anything. I wanna visit Dubai when it is built someday. "And then, of course, there are the religious folk, who might put 2 and 2 together and think that a suddenly unstable region (tectonically speaking) is signaling the end times..."
Well, there are religious folk on one end of the scale, and religious folk off the scale completely. Being one who believes in the validity of the Holy Bible, I've never seen anything about tall buildings signalling the end times. There are writings about "signs and wonders" in the heavens and on earth, and I suppose this building would qualify as both...lol. Another scripture says "knowledge will increase" exponentially. So I do marvel at all the new discoveries, technologies, etc., but as for a new, mile-high building...(yawn)...oh, excuse me. How about making my truck run on H2O??? Then I'd be impressed! Looks like Space Odyssey, one giant monolith. This isn't a skyscraper... It's a skyraper! "Well, there are religious folk on one end of the scale, and religious folk off the scale completely. Being one who believes in the validity of the Holy Bible, I've never seen anything about tall buildings signalling the end times." Yep, that'd be because the modern obsession with then end of the world popular with US extremist Christianity is more or less made up as they go along. The rapture, in particular, is a 19th century creation. Anyway, When buildings get to this sort of size... Really, what is the point? It's just showing off.